Well, I missed this AMA – sorry, but I’ve been super-heads down on work. 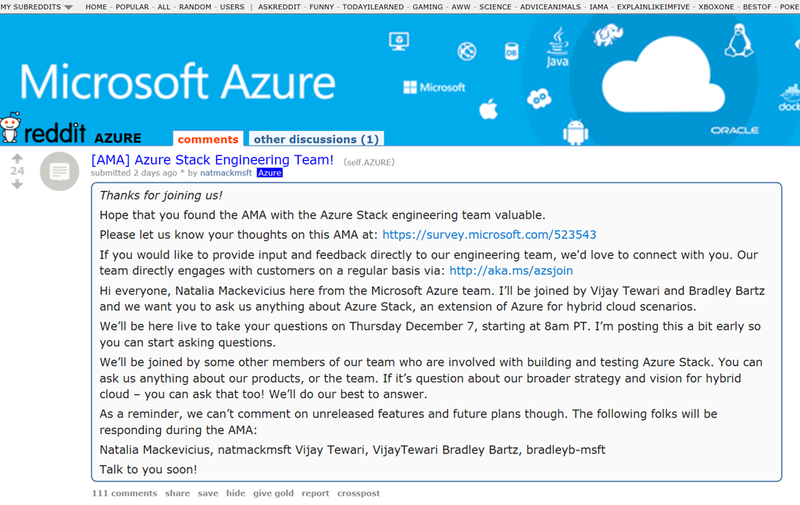 But fortunately, you can review all the questions and answers in the archive about “Azure Stack” directly from the engineering team. Who is responsible for lighting up… let’s say Azure Container|Kubernetes Service on Azure Stack? Is the the AKS team, or the Azure Stack team? How does the support work? The Azure Stack team can’t possibly be the product experts that the AKS team are. Yet, from what I know about Azure Stack, I know there are enough incompatibility points (lol, MSI? lol, metadata service) that will require feature work from the AKS team to make it work in Azure Stack. Or an Azure Stack employee basically working extremely closely with AKS team members. No? How does that relatioship work reliably for the customer who doesn’t care about this distinction? What complex workloads can you actually deploy with an ARM template to both Azure Cloud and Azure Stack? Same APIs, same features, same runtimes? Can you point me to these example ARM templates? How many customers are willing to publicly talk about Azure Stack success stories? Can you point to a company that is purely, straight-forwardly deploying identical workloads in Azure Stack and Azure Public Cloud today? Why do customers buy Azure Stack? too timid to go public cloud in one step? Now that Azure is launching a VMware side-by-side service, isn’t there a risk that Azure Stack will become irrelevant in the marketplace? What is next for Azure Stack? what other services and capabilities will you be adding to Azure stack in the next 6 months? Will Azure Stack become modular in the future? If I buy a 4 node model can I add more servers if I want to scale out? Why is it so damn expensive(especially in terms of requiring certified hardware)? Also when is Service Fabric coming? What is the impetus for forcing Azure Stack to be sold only as a part of a solution and not installable on what might be otherwise compatible hardware?